Jack Swain's Miss Ella rallied late in the stretch and outkicked Fair Point at the wire to repeat as the winner of the $200,000 Caress for fillies and mares 4-years-old and up on Monday at Saratoga Race Course. Pacquita Coqueta set the early fractions for the eight-horse field, going a quarter-mile in 21.84 seconds and the half in 45.00. Under jockey Joel Rosario, Miss Ella rallied in the final eighth and gained the lead in the last 70 yards, completing 5 ½ furlongs on the good Mellon turf in 1:02.30. Trained by Graham Motion, Miss Ella registered her fourth career stakes win, including a win in last year's Caress that was moved off the turf, boosting her career earnings to $595,334. “She handled it well. She won last year on a muddy track. But today she looked comfortable the whole way and she put in a nice run again,” said jockey Joel Rosario. Favored at 5-2, Miss Ella paid $7.80 on a $2 win bet. Ruby Notion finished third, followed by Paquita Coqueta, Pretty Perfection, Mississippi Delta, Summer Reading and Everything Lovely to complete the order of finish. Animal Appeal, Blue Bahia and Eila were scratched as was main track only entry Appealing Maggie. 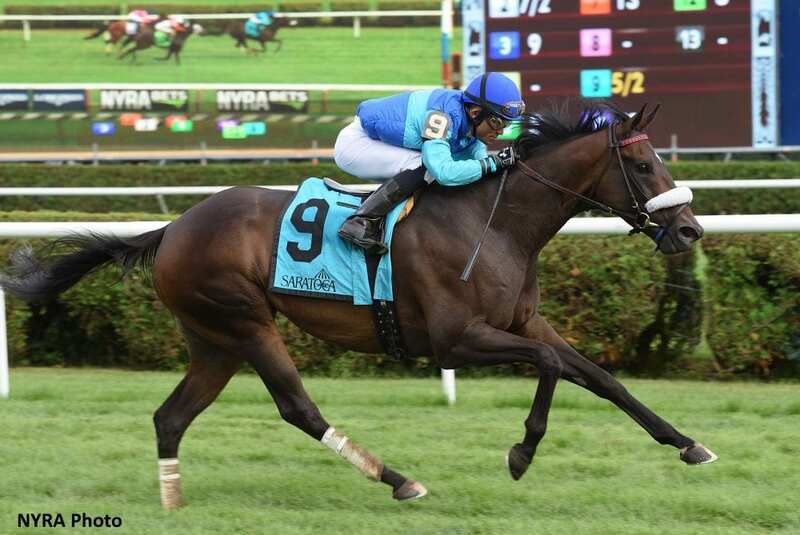 This entry was posted in NL List, Racing and tagged caress stakes, Graham Motion, jack swain, joel rosario, mellon turf, miss ella, pacquita coqueta, saratoga, Saratoga Race Course by NYRA Press Office. Bookmark the permalink.